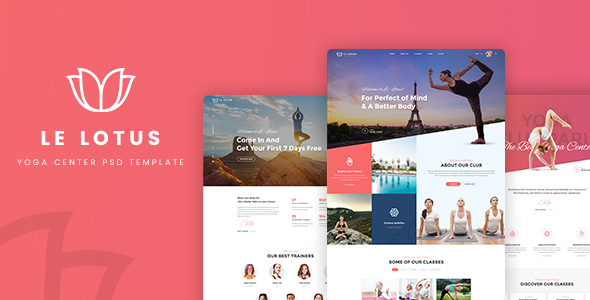 Le Lotus – Yoga Center PSD Template Created by ThemeSun. This templates have specific characteristics, namely: Le has features such as High Resolution: Yes, Layered: Yes, Minimum Adobe CS Version: CS3, Pixel Dimensions: 1920×10000, Print Dimensions: 1920×10000 . You can use this Le Lotus – Yoga Center PSD Template on Psd templates category for beauty, class, dance, gym, health, meditation, spa, sport, yoga and another uses. Le is the exclusive PSD template built dedicatedly for all kinds of Yoga, Fitness, Wellness, Spa, Health and Beauty center websites. Comes with 03 homepage version and fundamental class pages, event pages, trainer pages, the theme is suitable for any yoga class or other kind of health and sport center.